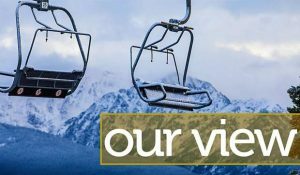 Monday’s Vail Daily reported the depth of opposition to the proposed Berlaimont Estates subdivision north and a bit west of Edwards. At issue is the only aspect of the plan open for public review: a road from the valley floor to the 680-acre parcel. If the parcel was along, say, the Colorado River Road, the property owners might have been building by now. Under Colorado law, parcels of 35 acres or more are exempt from local government planning and zoning regulations. The only requirement is building structures to meet local building codes. The proposed plan would put 19 units and up to nine accessory units on the property. All would be on parcels of 35 acres or larger. Since Berlaimont is surrounded by national forest land, the U.S. Forest Service must approve plans for an access road to the parcel across public property. The property owners are asking for a paved, two-lane road into and through the property. That road would be built in an area that doesn’t currently have improved roads. The federal approval process is where things can get tricky. While Forest Service officials are well aware of the hundreds of letters opposing the plan, and the 2,400 petition signatures urging denial, they’re also bound to uphold and enforce federal law. And federal law requires local public land managers to provide access to private property surrounded by public land. Just what kind of access is approved is the crux of this argument. The Wilderness Workshop has taken what seems to be the popular view: The land owners aren’t entitled to more access to their property than they now enjoy. Of course, the group believes the law supports that position. But the popular view isn’t always the legally correct one. White River National Forest Service Supervisor Scott Fitzwilliams and his staff are now looking at the proposal, as well as seeing if it meshes with the findings of a required Environmental Impact Statement. It’s complicated, and deciding in favor of the land owners won’t be popular. But “popular” and “legal” are often different things. Whatever happens regarding the road into Berlaimont, the people in the offices in Minturn and Glenwood Springs will be following the law to the best of their abilities, regardless of public sentiment. That’s what good adjudicators do, and it’s worthy of respect. The Vail Daily Editorial Board is Publisher Mark Wurzer, Assistant Editor Ross Leonhart and Business Editor Scott Miller.